A caravan of thousands of Honduran migrants is headed north in hopes of crossing the U.S. border. You may have heard some scary things about it. What's true and what's false? Here are five allegations bouncing around the internet that are definitely "alternative facts." MYTH 1: It's being funded by Democrats. Trump said at a campaign rally on Thursday that "a lot of money has been passing to people" traveling north from Honduras. A Republican from Florida, Rep. Matt Gaetz shared a short video that Trump later promoted of migrants being given cash and suggested that they were being funded by left-leaning activist and investor George Soros. THE FACTS: There is no evidence the caravan is being led by anyone other than Hondurans. Bartolo Fuentes, a former Honduran lawmaker and social activist, originally got the word out to Hondurans, calling them to meet at the San Pedro Sula bus station to leave the country. Guatemalan police arrested Fuentes last week in the middle of a crowd, shortly after Trump threatened to cut off funding to Guatemala and Honduras if they did not stop the caravan. The caravan now continues without Fuentes, with a handful of different leaders making logistical decisions about when to depart each city. 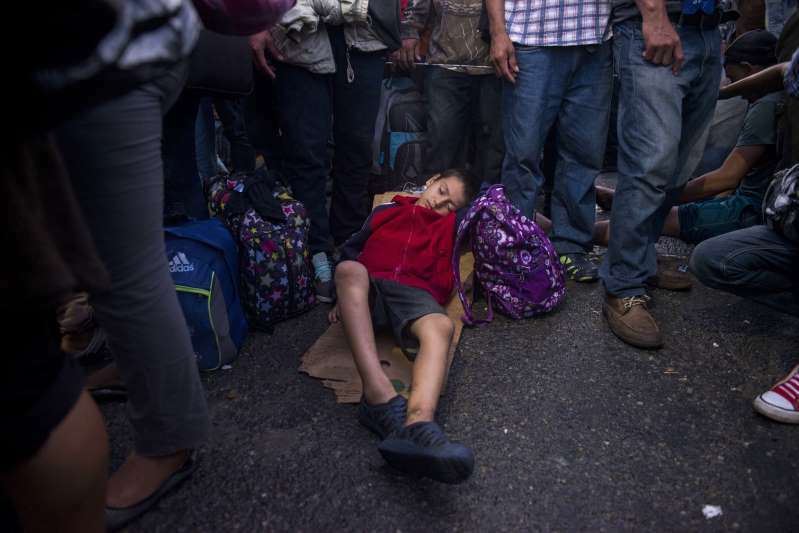 Immigration experts attribute the size of the caravan and the timing of its travel to cooler weather, as well as gang violence and political turmoil in Honduras after the country's contested presidential election last year. "The reason that the caravans have been organized are to help protect Central American refugees and migrants as they make the perilous journey through Mexico and to highlight their petitions for asylum," said Elizabeth Oglesby, a professor at the University of Arizona's Center for Latin American Studies. MYTH 2: "Criminals and unknown Middle Easterners are mixed in." In one of several tweets on the caravan Monday morning, Trump said there were criminals and people from the Middle East also traveling with the Hondurans. The tweet implied that there was a significant portion of people who are using the caravan to sneak their way into the United States to do harm. MYTH 3: The border will be flooded by the caravan. Trump has routinely called the caravan a mob and threatened to seal the border in order to prevent them from entering the United States. THE FACTS: Although the size of the caravan, estimated to be as large as 4,000, is unprecedented, it is unlikely that its members will all arrive at once. The largest portion of migrants that crossed Guatemala together was estimated to be between 2,000 to 3,000, while smaller groups were further behind. Adam Isacson, from the Washington Office on Latin America, said most caravans splinter further once they reach Mexico. "Several thousand people marching and staying together for 1600 miles is pretty much unthinkable," Isacson said, adding that there are many checkpoints the migrants will have to go through in Mexico. Some, he said, may even choose to claim asylum in Mexico. MYTH 4: The caravan has triggered a national emergency. Trump tweeted on Monday "I have alerted Border Patrol and Military that this is a National Emergy (SIC)." THE FACTS: Senior officials at U.S. Customs and Border Protection tell NBC News they have been given no special orders on how to deal with the approaching migrant caravan. In fact, the number of immigrants apprehended at the southern border has been surging over the last few months. In September, the number of families apprehended increased by 80 percent from August, according to media reports on numbers that have yet to be officially released. Oglesby said the caravan has "increased visibility" on a crisis that was already ongoing. MYTH 5: It's the Democrats' fault. At rallies and on Twitter, Trump has increasingly blamed Democrats for not passing immigration reform that would allow his administration to strengthen border enforcement. THE FACTS: Republicans have controlled the White House and both chambers of Congress since January 2017, and have not passed immigration reform or funded Trump's border wall. Federal court decisions and international asylum law dictate many rules hamstringing Trump's wishes, including how long children can be held in detention and the rights of asylum seekers. Those decisions will not be easily overturned, even with immigration legislation.